If you have never heard the word “Elizabethan collar” before, no worries. Most likely, you know what it is, but have never heard its original name. More commonly known as cone or E- collar for short (not to be confused with shock collar), an Elizabethan collar is as a protective medical device for dogs. 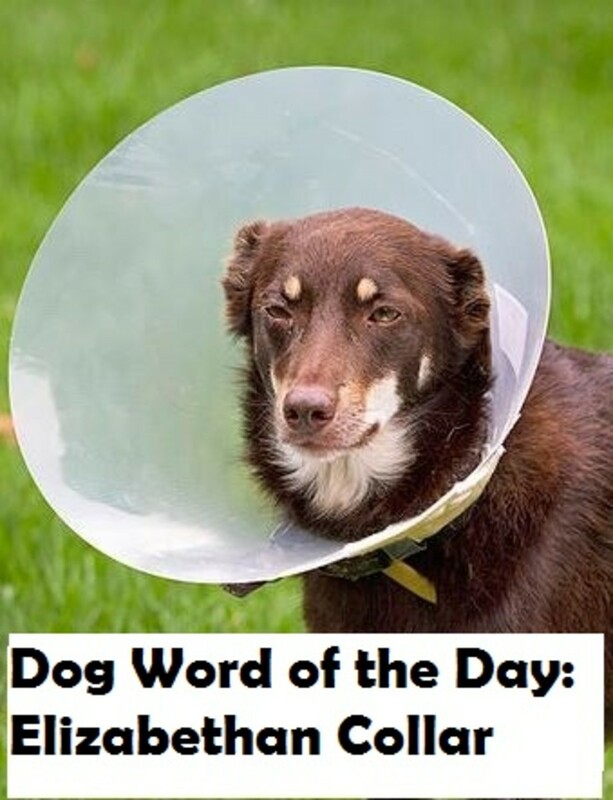 To put it more bluntly, it’s the infamous dog “lamp-shade,” “radar dish” or “cone of shame” collar you see dogs wearing around their neck when they’re on their way out of the veterinary office after undergoing surgery or some other type of minor procedure. A dog Elizabethan collar is a protective medical device shaped like a truncated cone. A truncated cone is basically a shape where the apex of the cone is removed to resemble a lampshade. The Elizabethan collar is usually made out of flexible plastic and it is meant to be attached to the dog’s collar to stay in place. The Elizabethan collar can be attached to the dog’s collar using strings or tabs. Since dogs come in different sizes, Elizabethan collars come in different sizes as well, and therefore, they can be easily worn from the tiniest Chihuahua to the largest Irish wolfhound. Due to these size variances, it’s important to ensure a good fit. Elizabethan collars are sold at most veterinary offices but many stores now also carry them and these are many different types. 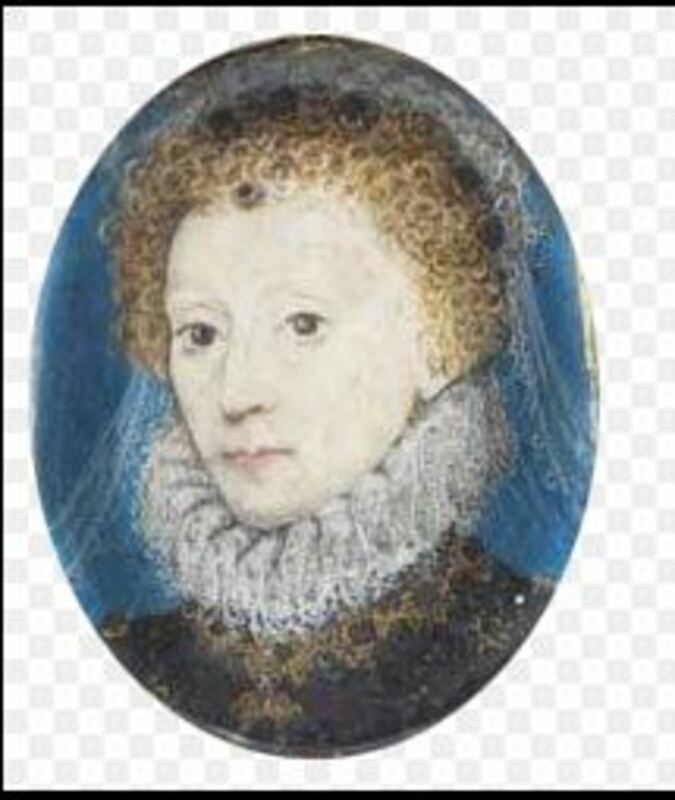 The purpose of an Elizabethan collar is to prevent a dog from licking or scratching his body and to therefore allow dog incisions and injuries to heal. When dogs try to lick their wounds, it’s not like they’re being naughty; it’s simply their instinct telling them to lick. Dog saliva is known for containing beneficial compounds that are capable of destroying the cell walls of gram-positive bacteria. Dog saliva can therefore help promote healing, diminish pain and inhibit bacterial growth, however, as with many things in life, too much of a good thing can be bad. 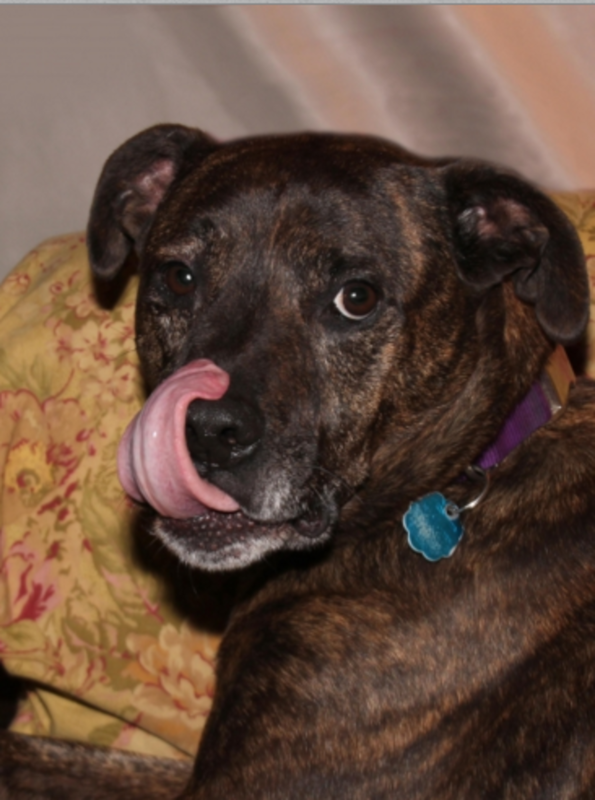 Given the opportunity, dogs will tend to lick a whole lot which can cause loads of trouble as the repeated abrasive action of the tongue, along with keeping a wound moist for too long (moisture attracts bacteria), may lead to an infection or injury. This is why the veterinarian may recommend that your dog wear the infamous “cone of shame”which comes extra handy when you are unable to monitor his activity and he could end up inadvertently injuring himself. And the last thing you want is going back to the vet to get your dog stitched up all over again! When properly fit, an Elizabethan collar should be short enough to allow the dog to eat and drink. At the same time though, you need to make sure that your dog’s E-Collar extends 3 inches past the nose so to prevent him from reaching the wound area with his tongue, points out Camden County Animal Shelter. A properly fit cone collar should be secure, but not too tight. Below you can watch a video on how to fit an E-collar. 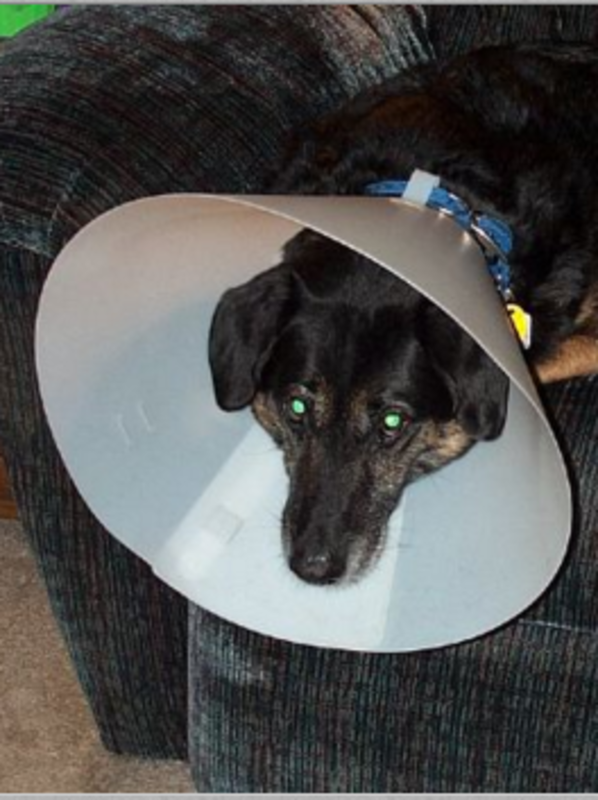 Many dogs get quite upset when they must wear a cone, and who can blame them? Elizabethan collars, especially the opaque types, restrict the dog’s peripheral vision creating blind spots to the sides which causes dogs trouble navigating around the home. Bumping into furniture and knocking over items from a coffee table due to tunnel vision can be scary for the dog and so can be getting stuck into corners. You can help your dog adjust be clearing a room from items that are easily knocked over and removing small furniture that can be in the way. Also, assist him going through doorways or around furniture. Dogs who refuse to drink or eat while wearing the collar may not like the collar touching the edges of the food and water bowl. A shallow dish may be an option or you can try elevating the food and water bowl to see if this helps. If your dog has a hard time to eat or drink, you can always temporarily remove the collar, but you must be vigilant to ensure your dog doesn’t start licking or scratching the wound or incision. Fortunately, most dogs adjust to wearing an Elizabethan collar just fine after a bit of time. It may help to feed your dog some tasty treats the moment the collar is put on and you can also praise him, letting him know what a good boy he is, and reassuring him that he still looks handsome, despite wearing that satellite dish around his head! Many dog owners find the use of an Elizabethan collar quite uncomfortable for their dogs. 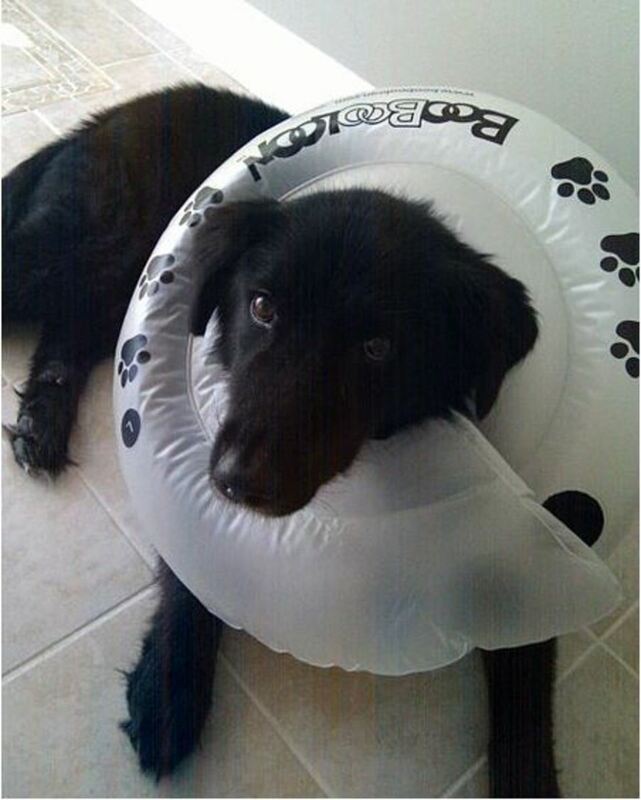 While some dogs adjust to wearing the cone, some may have a hard time accepting it as it interferes too much with their daily eating, drinking, sleeping and general mobility. This has caused astute marketers to look for alternatives to dog Elizabethan collars which are now growing in popularity. Soft fabric has been used to somewhat mimic the neck pillows people use when travelling on planes so that dogs have trouble turning their head around to lick their incisions. A classic example is the Kong Cloud Collar. Other companies make inflatable models, as the one seen in the picture on the left or collars that resemble neck braces (the Bite-Not collar) And some others make what’s known as a “soft collar” which fits best the more mellow fellows (eg. The Comfy Cone). Some dog owners have become quite creative in building their own home-made versions of Elizabethan collars using cheap material normally found at home. How effective these are, can be questionable, but they may temporarily do their job when dog owners need a quick fix to protect further their dogs from self-licking. Cardboard, paper plates, plastic flower pots, light-weight buckets and actual lampshades have been known to be used as temporary measures. Sometimes, if the wound is by the abdomen, dog owners may let their dog wear baby onesies or a shirt so to cover the area. Out of sight, out of mind! But a dog wearing a shirt should be carefully monitored as it can come off or the dog may chew it up or work his way under it to get to the wound. Alternatively, an ace bandage wrapped around the abdomen can be used to help prevent access to the incision. To work well, it must be snug, but not too tight. Ideally, you should be able to slip a finger under it. You can then secure the end with some medical tape so it stays in place, suggests veterinarian Dr. Kara. Did you know? If you ever wondered why the cone of shame is formally called an Elizabethan collar, here’s the answer for you. The term is inspired by the ancient ruff that used to be worn back in Western Europe during the reign of Queen Elizabeth I.